I’m really excited to say that Food Blog Forum is coming to Orlando! After much convincing, bothering and tweeting, Jaden of SteamyKitchen.com agreed to have a Food Blog Forum seminar in my hometown of Orlando, Florida on Saturday, April 9, 2011. I want to say that, this will be the first ever event of this kind in the state of Florida (correct me if I’m wrong). We’re thrilled to have it at Rosen College, the University of Central Florida’s School of Hospitality Management in Orlando. It’s a beautiful campus just miles from Universal Studios and Walt Disney World. We’ll have the Saturday all day seminar in a classroom-style setting. There will be tons of networking opportunities including a pre-party hosted by Whole Foods Market the night before (Friday) and a wrap-up party hosted by McCormick & Schmick’s on Saturday night. Sessions include branding, SEO, sponsorships, theme design, food styling and photography. I’m really excited about the line-up of speakers. They are: Jaden Hair of Steamy Kitchen, her husband Scott Hair, Helene Dujardin of Tartelette, Lindsay Landis of Purr Design, Peter Scott of IZEA, Jeff Houck of The Tampa Tribune, Heather McPherson of the Orlando Sentinel and Dawn Viola of Wicked Good Dinner. For the full list of sessions and the schedule for the whole weekend, visit the FBF registration page. I’m not really sure you can sense my EXCITEMENT. I attended the Food Blog Forum Atlanta event last year and had such a blast…Gwen of Bunkycooks.com organized the event and it was awesome! It was wonderful to learn so much as well as meet so many great food bloggers. 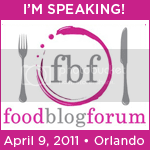 I’m thrilled to help bring Jaden and Food Blog Forum to Florida in April! Who is Food Blog Forum for? Anyone who is interested in food blogging or food photography. It’s a one-day seminar that’s going to be packed with tons of useful information that you can use immediately. You don’t even have to have a food blog to benefit from this event. I can’t wait to show the attendees the goodies our sponsors have in for them. 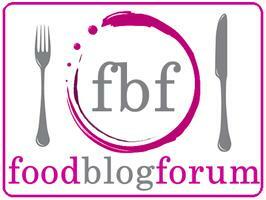 Hope to see you on April 9th at Rosen College in Orlando for Food Blog Forum Orlando! And thank you for sharing this event with your friends. Woohoo! I know how hard you worked to make this happen! I could be more excited for you. I checked out the agenda and it looks amazing! I am SO excited for you and glad everything came together! It sounds like a great event and if there is any way we can get there, we will do it. Hope all goes well and congrats!! 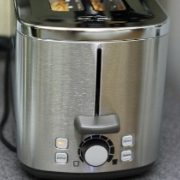 I came to your site and wanted to comment here, but got distracted by your awesome give-away! I just wanted to say congrats for working so hard on putting together an awesome schedule for the FoodBlogForum in Orlando. It looks like an impressive gathering! I’m going to see what I can do to go. We’ll see. But please know no matter what, I’m really happy for you! Congrats! And now, April really is not very far away so you don’t have long to wait.